Brilliance You Deserve! The Master IJO Jeweler Advantage! Did you know there are about 175,000 places in the U.S to buy an item of jewelry? Included in that number are about 115,000 small jewelry departments within larger department stores, about 44,000 single proprietors, mom and pops and internet sellers. In addition there are about 22,800 independent jewelers with employees that account for about 44% of the entire U.S. market. How would you pick the right one? Master IJO Jewelers is an elite group of retailers hand selected for membership in the Independent Jewelers Organization (IJO). IJO is an organization which only accepts jewelers with the highest ethical standards and superior professional integrity. IJO provides marketing and educational opportunities to over 1,000 members worldwide. As a Master IJO Jeweler, members receive benefits such as expert training. This allows them to update their knowledge, skills and expertise, which in turn helps the consumer to make a confident jewelry purchase. Group purchasing power allows Master IJO Jewelers to pass a significant savings on to their customers while maintaining the highest quality products they have come to know. And the fact that IJO Jewelers are active members of their communities means they strive to offer an unsurpassed level of service. Master IJO Jewelers adhere to an ethical code-of-conduct offering the honesty, trust, integrity and “Brilliance You Deserve”® no other jeweler can provide. 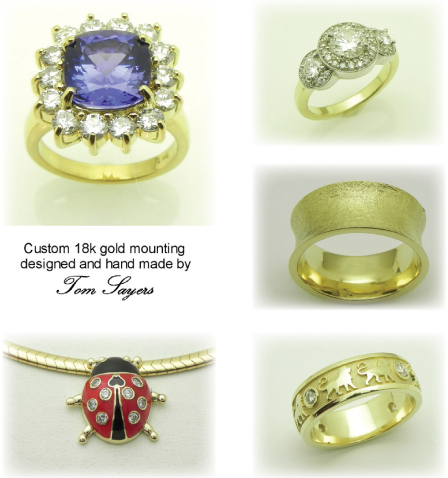 Sayers Jewelers and Gemologists are also Certified IJO Diamond Graders and have an IJO Certified Gem Lab. What is GIA ? The Gemological Institute of America (GIA) is the premier school for jewelry education in the world. It has many introductory jewelry courses but the ultimate is the Graduate Gemologist Diploma. What does all this mean to you? To become a jeweler and sell to the public all that is needed is a business license. There is no requirement to be formally trained. Therefore many jewelers have little or no training at all or just rely on what their supplier told them, which may not be accurate. For this reason, the consumer often gets a poor quality product. The GIA Graduate Gemologists are an elite few who have chosen on their own to seek the ultimate in training available to the industry. They are trained in Diamonds, Diamond Grading, Gem Identification, Colored Stone Grading. They have trained at GIA and passed vigorous testing before being awarded the Graduate Gemologist Diploma. Not one retailer in 10 has one. Sayers Jewelers and Gemologists has two full time GIA graduate gemologists to serve you as well as other staff members that have their diamond diplomas. You can be assured that you are dealing with a professional who knows his product and can guide you in the right direction to make sure your jewelry investment is a wise one. SAYERS JEWELERS AND GEMOLOGISTS is the only source in Delaware for Lazare ideal cut diamonds and FOREVER 10 ® ideal cut diamonds with 10 perfect hearts and arrows. The ultimate in brilliance. You have never seen a more brilliant diamond. 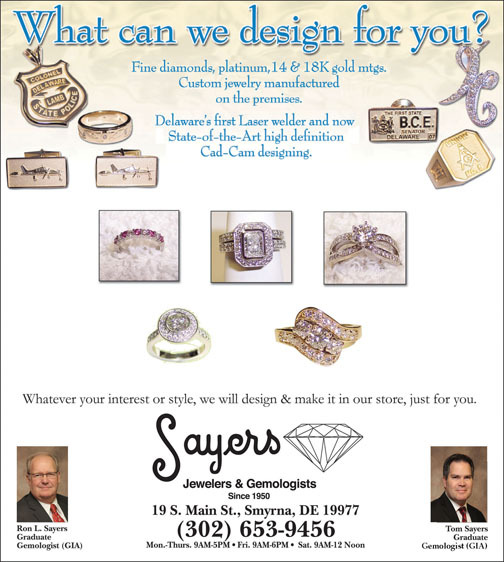 See the story of Sayers on our website at SAYERSJEWELERSANDGEMOLOGISTS.COM. Tom, I received the ring Friday. It is absolutely a Wonderful Piece of Art. I am extremely pleased with this fine piece of jewelry you have crafted. It is exactly as I envisioned it. ~Thank you. David P.